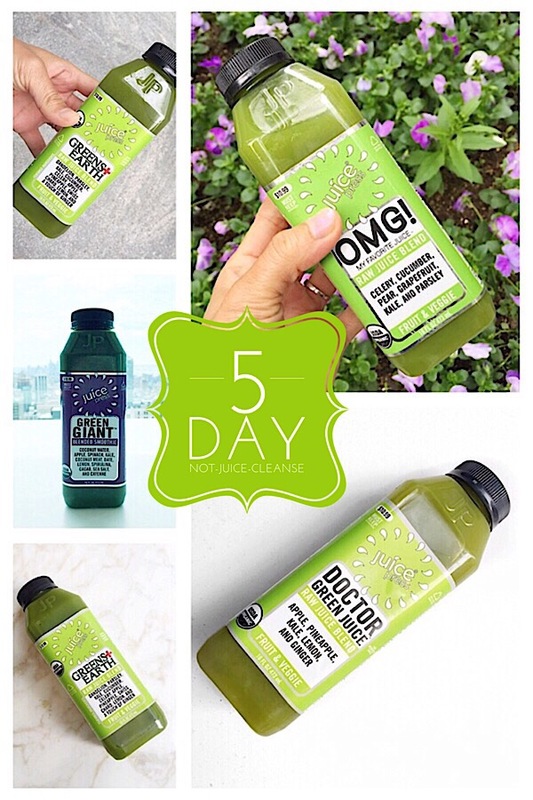 If you follow me on Instagram, then you know I recently did a 5 Day Not-Juice-Cleanse. For those unfamiliar with juice cleanses, they’re typically periods of time (the durations can vary) where you only drink juice. Nothing else. While I love the health benefits of fruit and vegetable juice, I’m a full-meal kind of girl. So while juice cleanses have always sounded interesting, I’ve always worried they would make me hangry. And you guys know, I’m more about what I can add to my diet versus what to remove. So, I thought…why not just drink the juice in addition to my meals? To be honest, I’ve never heard of a not-juice-cleanse before. There are many people who regularly enjoy juices in their regular diet, but I’ve not heard of anyone doing a period of back-to-back juices. I’m 99% sure I’m not the first person to do this, though. Hehe. The idea was to get the benefits of all the fruit and vegetable nutrition in addition to whatever I was getting with my regular meals. I was curious to see if I would see and (maybe more importantly) feel any different. As it turns out, I did! I’ll put my results at the end. 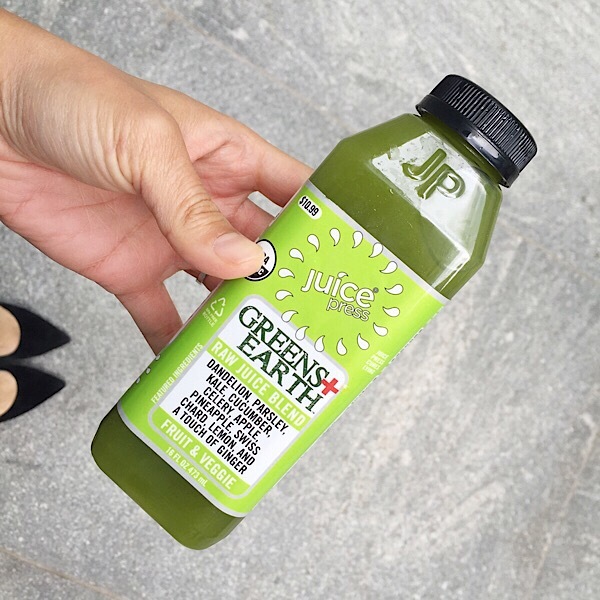 I hit up JuicePress, which has many locations throughout NYC. I’d had their juices before and liked their fruit and veg combinations. 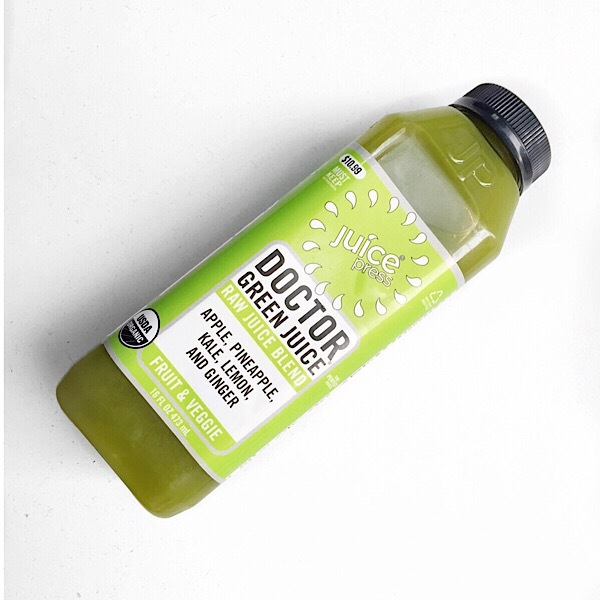 For the flavors, I opted to stick with all green juices. Those vegetables are just so good for you! It had been awhile since I’d juiced, so I went for a mix of fruits and vegetables. The all-veg ones sounded a little too intense for now. The OMG was pretty veggie-heavy, but it had enough sweetness. I loved that it had grapefruit in it, because I pretty much never eat that. When we lived in Florida, we had a grapefruit tree in our front yard. My mom used to love to climb into it to get a grapefruit. She’d slice it open and top it with salt! Since I was having a light lunch on Day 2 (salad), I went for a smoothie that was a little more filling. This is what JuicePress calls a “smoothie”, but I like my smoothies a little more frozen. This tasted like a thick green juice. Loved how many different ingredients they were able to fit into this, though. Here’s another juice that packs a punch. Look at all that good stuff! I went back to a simple juice on day 4. It seems like most juices have apple as the first ingredient. Not sure why, but I usually like the way these types of juices taste. And since I liked that Day 3 juice so much, I went for it again for the last day. Energy: While I didn’t feel an overall energy increase, I did feel a strong sustaining energy after drinking each juice. I had them pretty much every day in the afternoon, and it really helped with my afternoon lull. I didn’t even think about coffee! Skin: My skin seemed to be a bit clearer. Cravings: I had almost no cravings. If you’ve ever read Thrive by Brendan Brazier, he has a great explanation on how cravings work. At a high level, he says they’re our body’s way of telling us what it needs. Crave sweets? You may need fruit. Etc. For me, I do notice when I’m eating well and getting plenty of fruits and vegetables, my cravings go way down. And this definitely happened here! 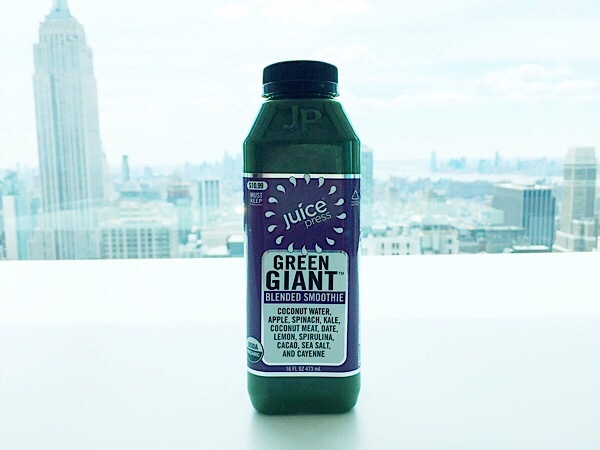 While the not-juice-cleanse was fun to do short term, I don’t think it’s sustainable. It’s definitely expensive. 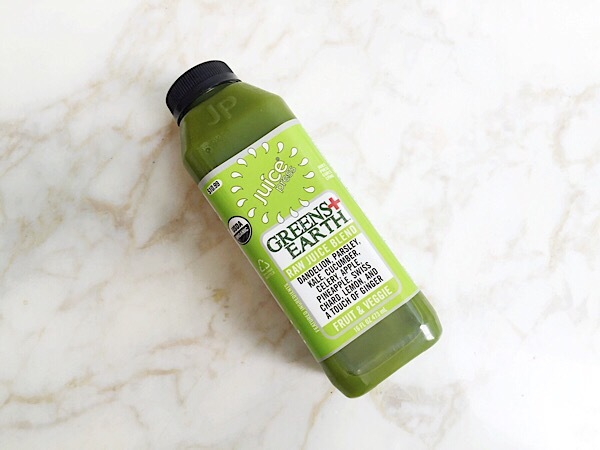 One of my Instagram followers joked that at the price per juice, it was more of a wallet-cleanse! If I were to drink juices regularly, I’d have to revisit my eats. While it may be difficult to get your day’s necessary calories on juice alone, they’re certainly not low-calorie. Each juice ranged from about 200-400 calories, which is almost how much I aim for in a meal (at the high end)! Not that I have a problem drinking my calories. I’d just want to make sure they were balanced so I didn’t start accidentally consuming too much. Still, if I’m needing a swift kick of nutrition in the future, I’d consider doing this again for sure! 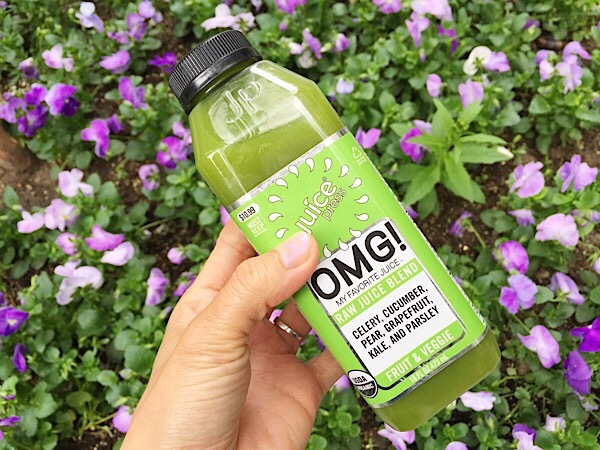 Have you ever done a juice cleanse? Or even a not-juice-cleanse? How did it go?